The Mackenzie Falls is a gorgeous natural waterfall cascading down the cliff in Grampians National Park, located in Victoria, Australia. It is known for its natural beauty, cool and clean water. It's located only in forty minutes drive (roughly 16km) west northwest from Halls Gap (a tourist hub and a small town in the heart of the Grampians National Park) on the Mount Victory Road. It's well signed and one of the most popular spots in the Grampians. From the Halls Gap drive west along the winding Mount Victory Road. After 5.5 kms turn right. At the T intersection turn left to get to Cranages car park. Facilities at Mackenzie Falls include a carpark, picnic area, toilets and a kiosk. There is lots of parking, though it can get very busy towards midday. This image belongs to the travel and nature stock photo library. This stock photo of MacKenzie Falls is available for licensing for commercial and editorial uses including websites, blogs, books, magazines, brochures and advertising. Restrictions may apply for images which contain third party copyrighted material or sensitive subjects. Photos of artwork are for editorial use only. 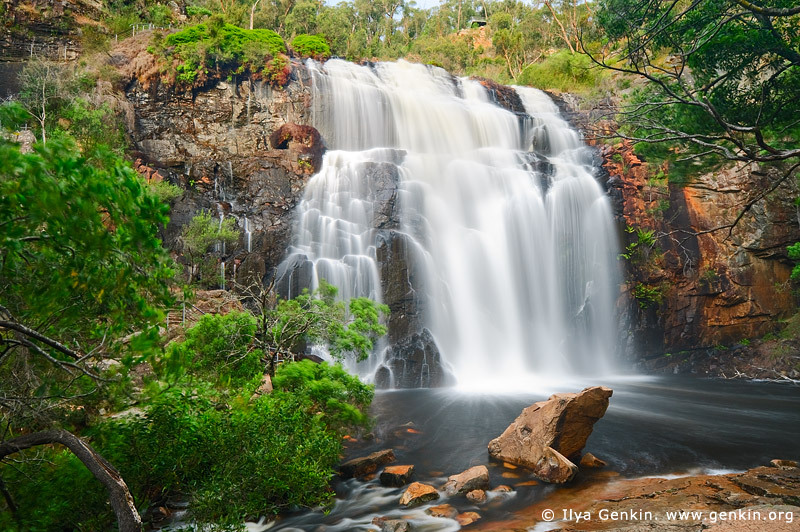 This image id VIC-MACKENZIE-FALLS-0002 of MacKenzie Falls, is copyrighted © by Ilya Genkin. This is not a public domain image.